After a spectacular Pluto flyby on July 14, the unmanned spacecraft has a new target to aim, as New Horizons’ team picked the next destination for it — a planetoid dubbed 2014 MU69, a much smaller ice ball in the distant Kuiper Belt, NASA announced on Friday. MU69 2014, nicknamed ‘PT1’ for ‘Potential Target 1, is a small Kuiper Belt object lies a billion miles beyond Pluto’s orbit. In summer 2014, NASA’ Hubble Space Telescope discovered this planetoid among other five small icy objects, but New Horizons’ team has selected MU69 2014 as the next potential target, a great choice as Alan Stern said. It takes less fuel to reach MU69 2014 than other possible targets and that will leave more fuel for the flyby, for ancillary science and greater fuel reserves to protect against the unforeseen. We expect it to be much less expensive than the prime mission, while still providing new and exciting science. Scientists estimate that MU69 2014 is under 30 miles (about 45 km) across, between 0.5 and 1% the size of Pluto — which is 1,473 miles (about 2,370 km) across. Though, its more than 10 times larger and 1,000 times more massive than typical comets (Comet 67P/Churyumov, targeted by the European Space Agency, is 4.3 km across). It is located roughly one billion miles (1.6 billion km) beyond Pluto. The new target intrigue scientists because it represents a primordial object in the Kuiper Belt. 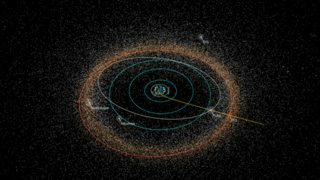 The detailed images and other data that New Horizons could obtain from a KBO [Kuiper Belt Object] flyby will revolutionize our understanding of the Kuiper Belt and KBOs. New Horizons Path to its nex destination, planetoid 2014 MU69. ©NASA/JHUAPL/SWRI/ALEX PARKER. However, before New Horizons spacecraft starts its new assignment, the team running the mission will have to convince NASA to get permission to carry out the ‘Potential Target 1’ mission by 2016. That proposal will be evaluated by an independent team of experts before NASA can officially approve the mission. Whether it continues its journey or not, the New Horizons has already earned national fame for its amazing photos of the dwarf Pluto. Nevertheless, New Horizons will perform a series of specific maneuvers between the October and November of this year, to make sure it’s not wasting fuel and to set its course toward 2014 MU69 — encounter expected to take place on Jan. 1, 2019. New Horizons was originally designed to flyby Pluto system and explore additional Kuiper Belt objects. It took off from Earth in 2006 and hit a speed of over 36,000 mph (about 58,000 km/h). 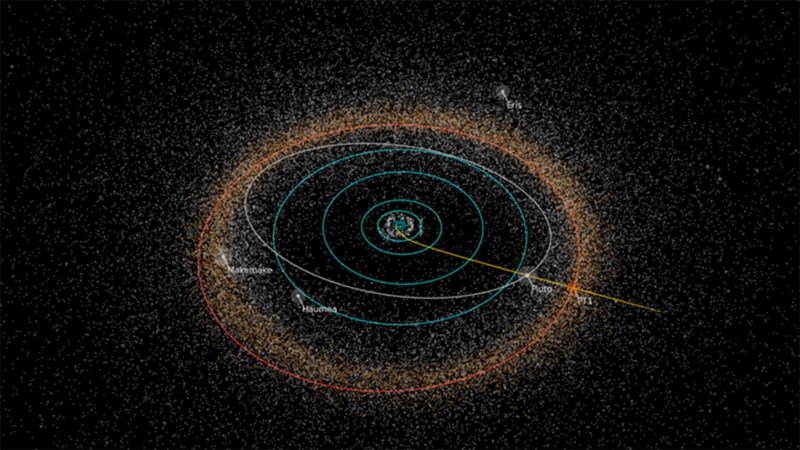 Now, it is about 33.7 million miles (54.2 million km) beyond Pluto. It’s still sending back data gathered during the encounter on July 14. It has extra hydrazine fuel on board and its scientific instruments, communications and power system were built to keep working for many years.